Darrell described himself in B-Metro: The Magazine of Metro Birmingham Living as an artist that is “multidimensional rather than multimedia”. Some may reference Darrell by his quirky character driven mixed media portrait paintings, his wonderful found object assemblages, his colorful paper-scaled wood fish, or his mixed media sculptures using repurposed “cast offs and overlooked treasures” and turning them into fun, funky 2D characters like a painted bird with a spatula wing & vintage button eye. He has a nack for bringing life to inanimate objects as only an artist can. 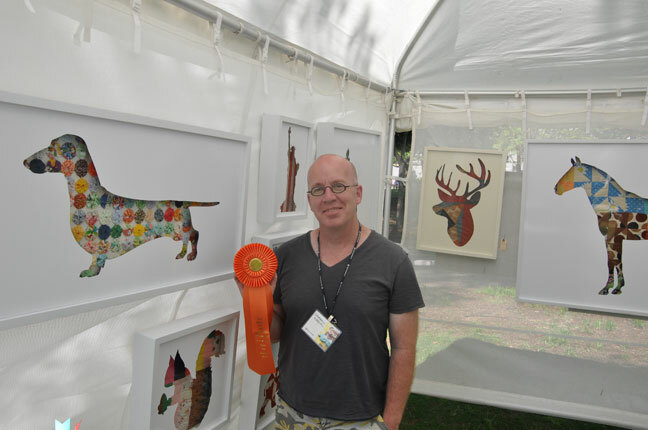 His most recent shadow box work features laser cut screens of recognizable images with recycled quilt backgrounds, and are harnessing his college design training, his love for reuse, his passion for spotlighting the handmade of yesteryear, and his overall graphic edge. “I see these works as being very vibrant, and having a strong sense of the renewal of life.” Even though he could get lost rummaging around a great second hand or vintage store for art assets to be used in future works, his artistic vision for what he finds is new, fresh, and defines his artwork as truly original, whimsical, and very Darrell.